without exaggeration (to avoid necrosis), and that without any volume augmentation. The Endopeel techniques can lead if decided by the facial plastic surgeon or cosmetic dermatologist practising dermatosurgery to a pretragal skin excess, which can be removed, and that too without any volume augmentation. 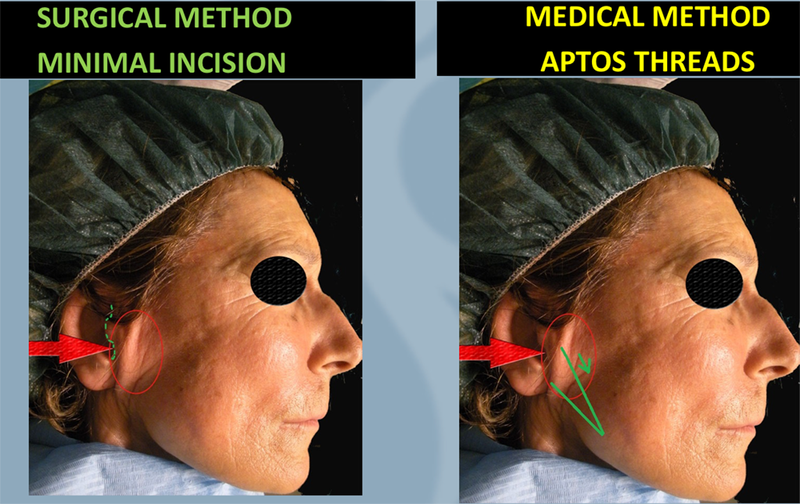 These techniques can be proposed to patients wishing to maintain the benefits of a surgical face lift, to patients which are not candidates for the surgery, to surgeons who want to complete their surgical operation acting on the forbidden areas for the surgery (terminal ramifications of the facial nerve) and/or the areas which are not reachable for an invasive surgery . 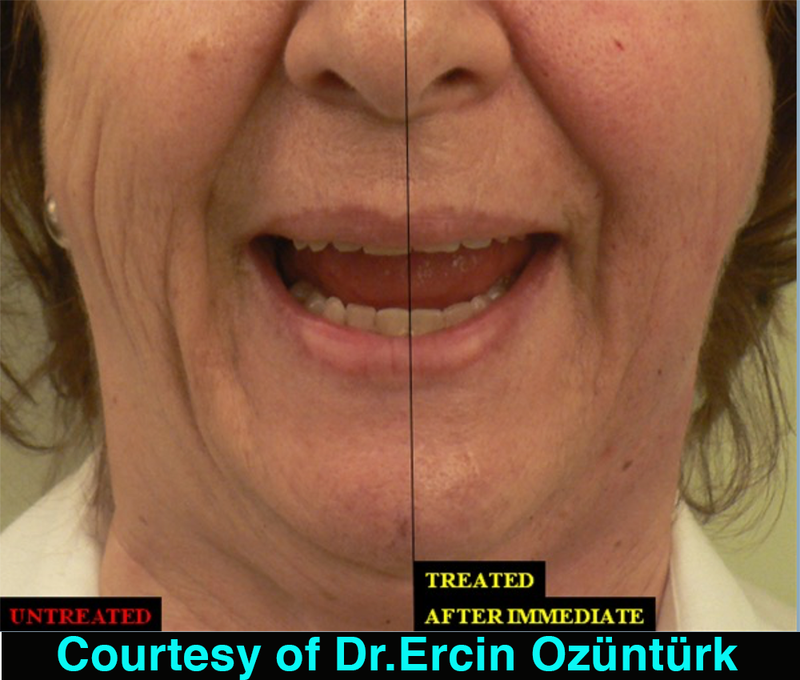 The advantages of these techniques are important for the patients: the immediate effect, the absence of scars, the absence of down time, the absence of social eviction, as the transitory complications which are limited only to short duration edema and ecchymosis which may be avoided with the use of some medications. Facial paralysis can benefit too of these techniques to decrease the bad social aspect of facial asymmetry. The threads are creating a suspension of tissues and in english suspension or lift ( towards up) can be used as lift . But on the surgical point, medical threads don t lead to any skin removal. To perform a scarless true facelift with an immediate result, without using volumetric medical devices or paralyzing drug. To give back the lost tension to muscles involved in a facial paralysis. Intramuscular trivectorial injections using the surgical logic of a facelift require a basic anatomico physiological knowledge to realize a nasal labial furrow lifting on one side and to lift the sadly baggy low jowls on another side as to make a recontouring of the mandible. All patients who desire a surgical or a not surgical can be candidates, as those not being candidate for any kind of filler injected in the naso labial furrows Figure4 ( the fillers not only can give unaesthetic aspects called rolling bulges, but are too often sources of complications like granulomas, necrosis, migration, nodules etc. ), just as those which have the first semiological signs leading to the right indications of face lifts . Our criteria of exclusion are: exaggerate alcoholic patients, heavy smokers, pregnant women, subjects under 18 years, patients known with allergy to peanuts and arachides,or those having antecedents mentioning a Quincke edema, All the patients without any exception when the outside temperature exceeds 40°C are also excluded, because edema can last for 1 week but regress under corticotherapy if this one is given right before beginning the procedure. The face lift effect is early and will be relayed by the late peeling effect, specific to the techniques Endopeel. It is easy to prove objectively the effectiveness of this treatment by treating, for example, only one half face on the same patient and by making a comparison between the treated half face and the controlateral untreated one by pure visual inspection, or by photographic images, or by using cephalometric points of reference. Less asymmetry and none social eviction for patients affected with facial paralysis. - Syringes 1 ml luer lock or a multihole canula 2.0 mm. - Flexible needles for the face 30 g.
- 1 needle 18 g to aspire the solution of the patented oily carbolic acid. - A post, Endopeel, cold cream. The technique known as standard treats 7 areas: the malar area, the zygomatic area, the masseter area, the area of the lower 1/3 of the face, the mandible edge, the angle of the mandible, the cervical area being above the higher limit of the cricoid cartilage. The technique to lift the nasolabial furrow will involve particularly the 8 following muscles: major, and minor zygomatics, risorius, buccinators, depressor of the angle of the mouth, elevator of the angle of the mouth, elevator of the upper lip and of the nasal aisle. These 2 last techniques are rather reserved to the specialists, because they are not only one complement of the traditional surgery of the face lift while working on the zone of the terminal ramifications of the facial nerve (danger zone for the surgery), but also allow maintenance of a surgical face lift while working on the facial muscles by myopexy and myoplasty. The most current errors are not the IM injections made in SC (subcutaneous) which will give the desired effect (because the patented oily product will diffuse from SC tissue to the muscle) will use more quantity of product and will be responsible of an important edema not appreciated by the patients, which can last between 3 and 8 days without medication. Another error consists in touching the periosteum with the injection needle, which will provoke ecchymosis which can be hidden thanks to a makeup and which will disappear from 3 to 8 days without discomfort for the patient. The intra vascular injection of Endopeel carbolic acid cannot be regarded as an error, considering the sclerosing effect of this substance. The injection into the motor plate or any nerve of carbolic acid is known for the treatment of the trigeminal neuralgias and may slow down the speed of nervous conduction for one short duration. The side effects or complications are only transitory and are summarized with an early edema and some ecchymosis easily treated and being able to be avoided. As for late edema occurring at the 10th day after the procedure, it is related to an allergy to peanuts and is treated only with antihistaminic. 2% of the Asian population is allergic to peanuts. Actually there is no alternative to the myotension, myopexy and myoplasty using other products and techniques than Endopeel. But the Endopeel techniques can be potentialized using chemical peelings as other existing treatments in medicine and cosmetic surgery (skin tightening effect with radio frequency 4 MHz).Some authors combine Endopeel techniques with PRP, threads,and rarely fillers or botulinum toxin. But all semiological rejuvenation effects could be seen immediately on the half face treated after few minutes. After dissection, the aspect of the treated masseter was similar to a young alive masseter with a nice color and with good tension compared to the untreated masseter looking atrophic, without vitality without any tension and with cadaveric color. Also some recent experimentation demonstrate that, Endopeel, works also on very thin muscles, even in absence of nervous signals. Until now, the concept of facial rejuvenation was based only on volume augmentation concept (fillers) as myorelaxation with myoatrophy (botulinum toxin) ;from now and thanks to the Endopeel techniques one acts not only on the myotension by preserving the muscular mass and without affecting the muscular contraction but also on the myoplasty and the myopexy. With this fact the indications of the fillers become more restricted and will apply only to the depressions which remain after tissue tension of the selected areas. Finally chemical true face lifts are not due as much of manufacturers claim it with an increase in volume by fillers but rather with a handing-over in tension of tissues with tightening effect like the Endopeel techniques. 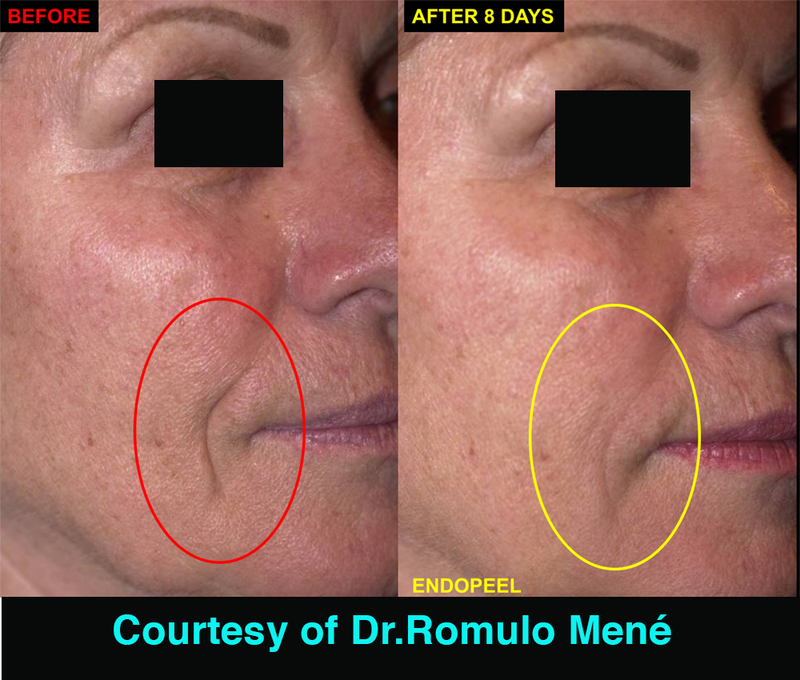 The techniques of Endopeel are thus a new strategic weapon for the facial plastic surgeons and dermatologists enabling them to complete and/or maintain a face lift and to propose an alternative to the surgery. Tenenbaum A (2009) La tecnicaEndopeel- La medicinaestetica-A.Redaelli, EEAFlorence. 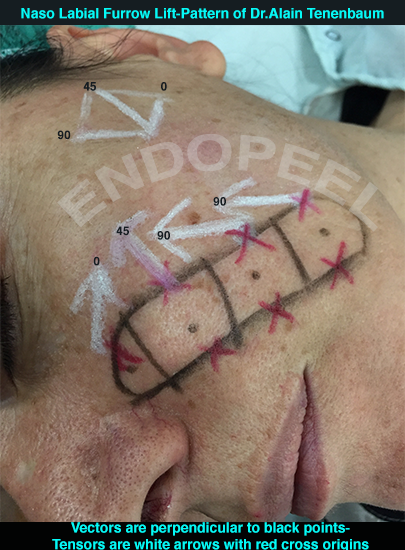 Figure1 : Medical Facelift using Endopeel Techniques.Isovolumetric method just repositioning the facial muscles. No Fillers. No Botulinum. 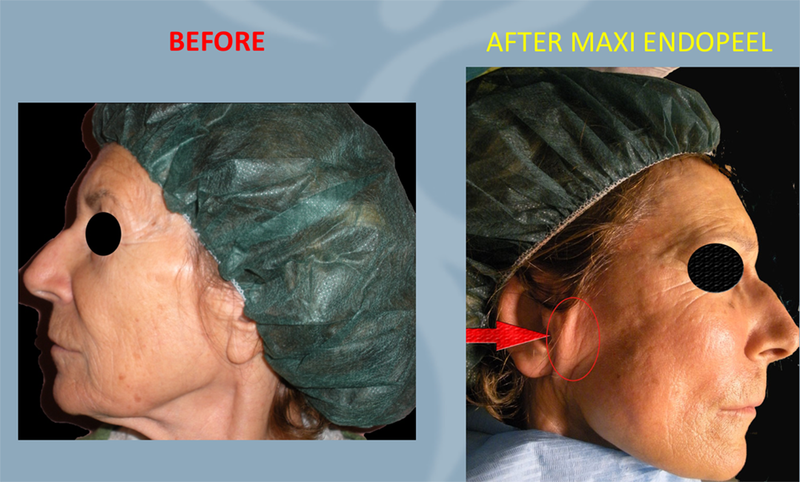 Figure2 Endopeel techniques applied to the face, especially on the medium third of the face , can be or medical or surgical.More than usual number of injections of the patented mixture using oily carbolic acid , will lead to an excess of tissue before the tragus, like here on the right side of the face of this old female patient. Such skin excess can be removed surgically like a dog ear.This prooves that Endopeel is a true lifting. Figure4 Naso labial furrow are best treated with Endopeel than using fillers.Fillers mostly create an inaesthetic rolling bulge. 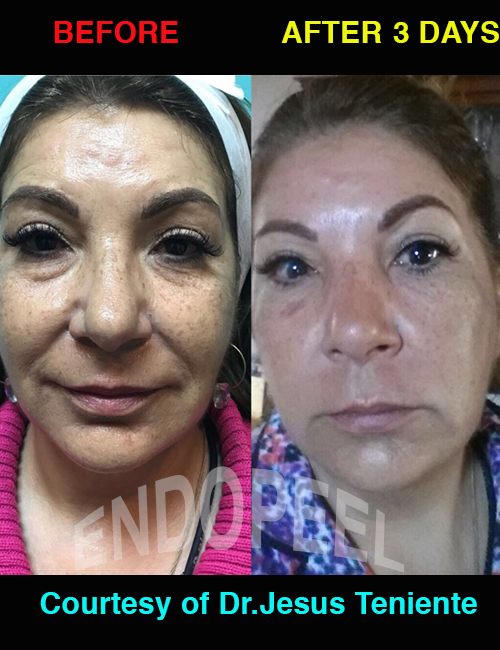 Figure5 Endopeel is useful to hide the facial asymetry improving it with 1 session for 6-9 months duration ( repeat the sessions for the maintenance and improving the results)in case of sequellae of facial paralysis.Endopeel is helping in this way such patients to go back to a normal social life. 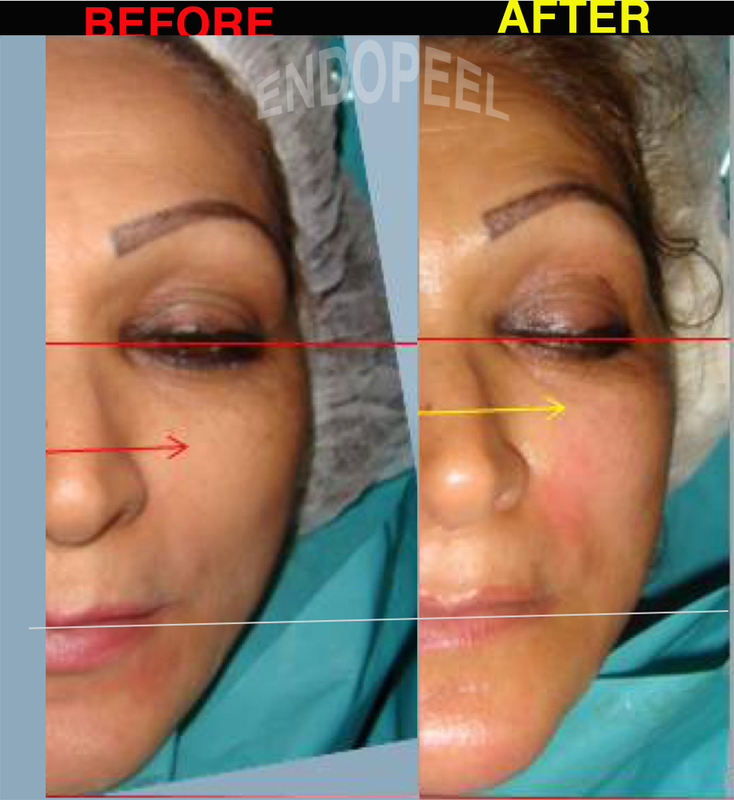 Figure7 Immediate effect of Endopeel, not only static but also dynamic without paralyzing any muscles. Endopeel is isovolumetric.Such effect will last 6 months and the procedure needs to be repeated. 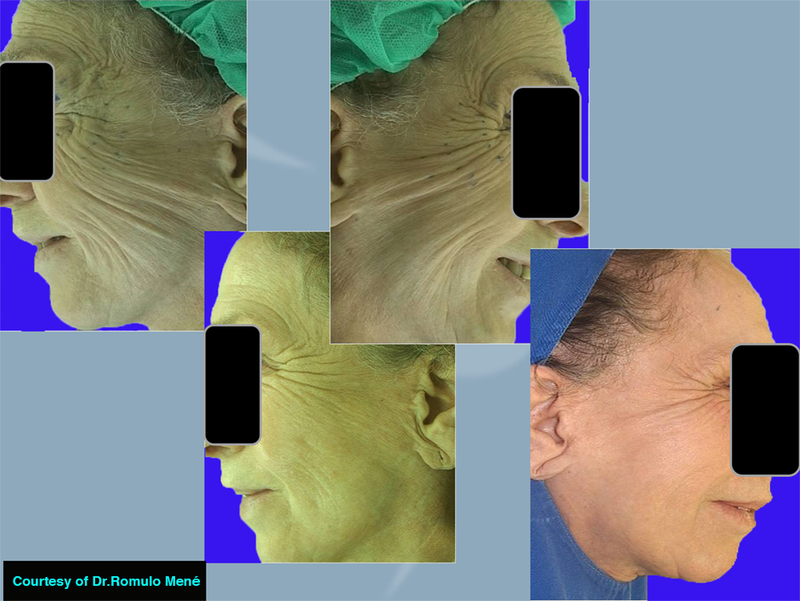 Figure8 This 70 years brazilian old female has been treated 7 times in 2 years.The medium third has been treated as she refused to treat other areas like forehead or pericoular area.She got as well a skin quality improvement ( late peeling effect). 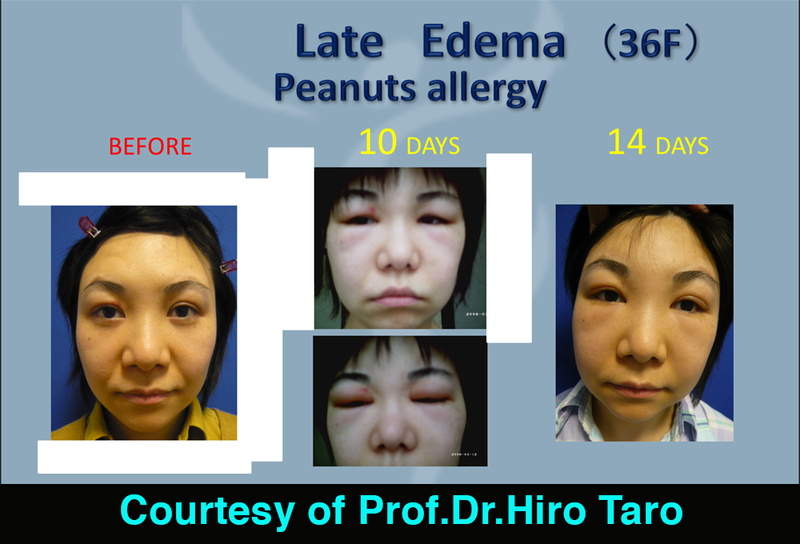 Figure9 Late edema may occur if the patient is allergic to arachides ( peanut) especially amonthe asian population.This edema appears mainly 10 days after the procedure and can be treated using antihistaminics combined or not with corticoids. It is recommend to patients wishing an endopeel facelift not to eat arachides before and after the procedure and not to drink beer ( beer contains arachides). 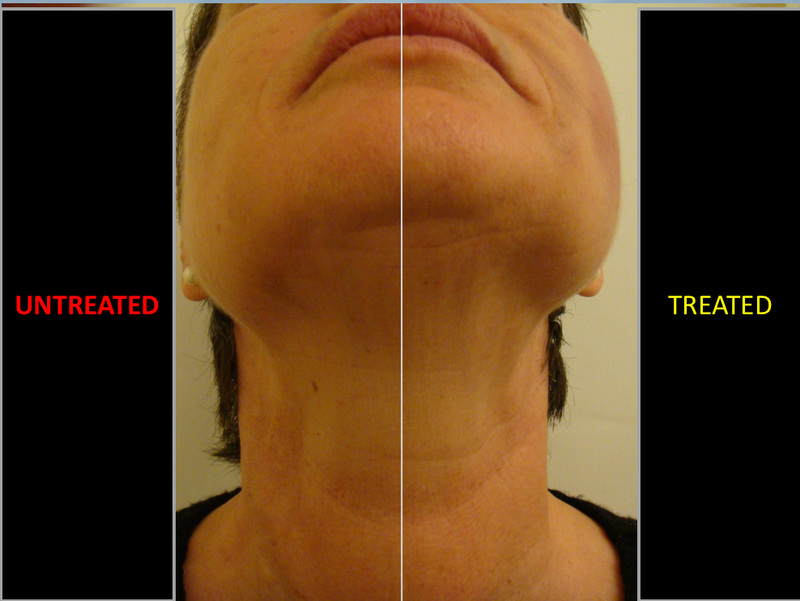 Figure10 : Lower third left hemiface treated on a female patient.The saddy low jowl on left side of the patient is lifted, the left hemimandible looks higher and shorter and the hemileft neck is concave . Figure12 Experimental study on the masseters of the cadaver.The patented oily carbolic acid has been injected in the left masseter ( 0.05ml) and 30 minutes after the aspect of the cadaveric masseter treated by Endopeel appears normotrophic, with a good colour,with a new shape ( myoplasty) and a tension ( myotension). 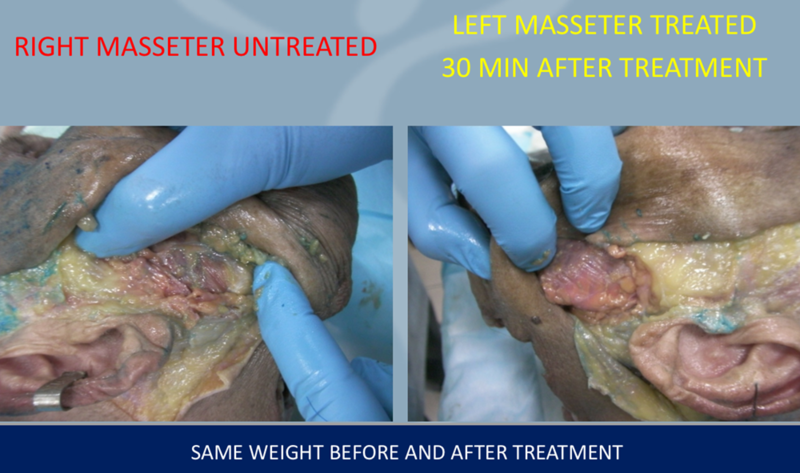 Both masseters left and right or treated and untreated have the same weight. This prooves the chemical isovolumetric myoplasty and leads to indications for hypotrophy of muscles, like sequellae of facial paralysis.